If Snowpiercer feels a bit one dimensional, that’s because it is. It’s linear, with a plot as streamlined and direct as a bullet train. But that’s exactly the point. The action is telescoped down to the length of a single train carrying the only survivors of the human species on an endless loop across a frozen landscape. Snowpiercer takes this claustrophobic setting and uses it to tell the story of revolution, a Great Train Robbery where the prize to be won is control of what’s left of the human species. The background: in the very near future a failed experiment to reverse global warming has resulted in a deep freeze of the entire planet. The only survivors are the passengers of a luxury train with a perpetual engine that ceaselessly travels a worldwide circuit. The train is a closed, self-sufficient system. Seventeen years into the voyage a strict hierarchy between the cars has developed, with the first class passengers living in luxury and worshiping the benevolence of Wilfred, the designer and conductor of the train that sustains them, while the passengers in the rear cars live in squalor eating with children occasionally abducted by the crew of the front cars for unknown purposes. Conditions are, of course, ripe for revolution. The effectiveness of the movie arises from its linearity. It’s set on a train. There’s nowhere else to go but back toward the rear or up toward the engine. The protagonist is Curtis, a man who leads a revolt to take control of the engine by pushing forward, car by car. This is a familiar motif if you’ve watched pretty much any western ever (or Back to the Future III), but here the difference is the surreal transformation, the slow blossoming of color, as the revolt surges up the train and moves from cars of industrial grime to bourgeoisie opulence. A heavy stamp of the movie’s origin in graphic novel format remains, especially in the elegantly brutal fight scenes when the rebellion reaches its first major obstacle (brutal because bullets are supposedly extinct on the train, so spears, bludgeons, and axes are the order of the day). When I first heard the premise of this movie with its not-so-subtle commentary on social hierarchies, I assumed the movie would feature a somewhat more metaphysical (or at least futuristic) train that literally circled the entire world. I imagined the revolution was going to end with the realization that there was no front or rear to the train, that the characters would continue passing through a long series of cars only to eventually arrive back where they started from. There might even have been an analogy somewhere in that about the lowest classes themselves being the engine that drove society. Spoiler alert: that’s not what happens. This is an actual finite train, with a front and a rear, but the revelations Curtis experiences when he reaches the engine are far from unexpected. In fact, the astute viewer has probably figured them out pretty soon into the movie, with the first clues that perhaps this rebellion is not as spontaneous as its participants would like to believe. For most of the movie it feels as though the questions Curtis wants answered are what’s driving the plot, but when those answers are finally given, you realize they’re not really what you wanted anyway. In retrospect, the engine that actually drives the plot is justified outrage. Any subtly that could have been explored on the side of the train’s crew—embodied in Ed Harris’s portrayal of Wilfred and Tilda Swinton’s wonderful depiction of the minister (probably the best character portrayal in the movie, priceless in her initial speech to the inhabitants of the rear cars)—has to be overplayed with brutality to convince the viewer just how justified this revolution is. The plot skirts around legitimate discussion of how disciplined and carefully managed life on a self-sustained train would actually have to be to instead focus on how heavily-handed this discipline is carried out so sympathies stay firmly with the protagonists. There’s a lot of grey here that could have been explored. As it stands, the moral basically turns out to be something like: don’t be a dickish train manager. The most powerful reveal, in my opinion, was the stuff that happened seventeen years before the story begins, as Curtis makes his confessions to his last surviving companion at the entrance to the engine car. There are themes of true self-sacrifice here amidst painful brutalities that offer some of the film’s most devastatingly effective lines. Yet all of that is in the past, and we get it here only to better understand why Curtis hates Wilfred so much—in a word, to keep fueling our justified outrage, which at this time might be dulled by seeing what life on the train actually involves. 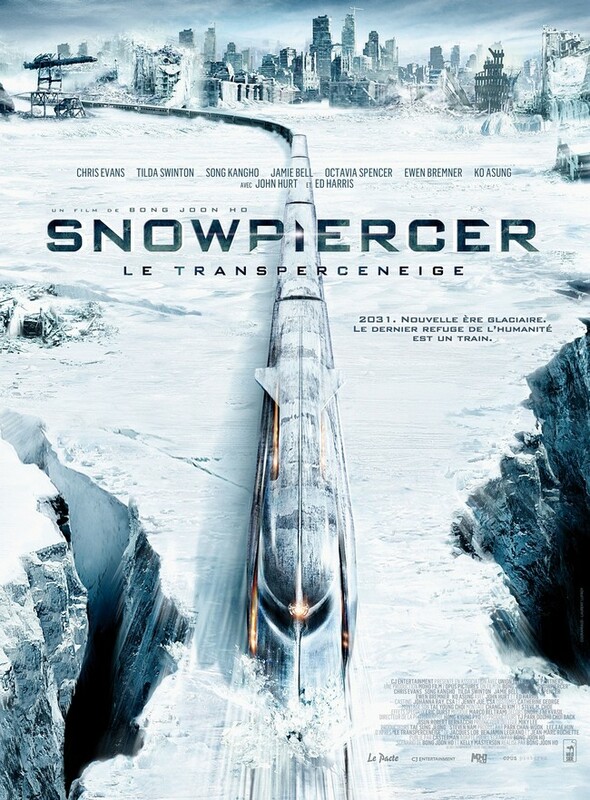 For an excellent example of a movie that sets itself up perfectly for the sort of action it wants to depict—focused and linear along the length of a train—Snowpiercer is a success. The action is gritty and believable and beautifully orchestrated. The plot is fast with plenty of twists and bumps. As far as social commentary, an analysis of class relations, or apotheosis as god killing, it doesn’t do quite as well. The sermons are too predicable, the moral too pat. Some spoiler thoughts regarding the end of the movie: Are we really to believe the train didn’t have any way of measuring external temperatures? And if it did, what do we make of Wilfred’s motives for keeping everyone trapped on the train? And the final scene: I get the feeling, especially with the way the plot played with snow and Inuit heritage, that we’re supposed to find the shot of the polar bear hopeful and optimistic: life persists. But seriously? We have two kids standing in the wreckage of a train, face to face with one of Earth’s most effective predators. How are we not supposed to read this as hopeless? This entry was posted in Reviews and tagged movies, post-apocalyptic, reviews, science fiction, Snowpiercer on November 11, 2014 by boldsaintcroix.